This ailment is often associated with stalwart Schwarzeneggerities, it’s no wonder that most people don’t refer to athlete’s foot by its wimpy clinical name: “ringworm of the feet”. Athlete’s foot is caused by a fungus that thrives in warm, moist conditions – and the closed shoes present a good incubator for these organisms. A lot of people who think they have athlete’s foot actually have another condition – usually eczema, dermatitis or some kind of allergic reaction to their shoes. 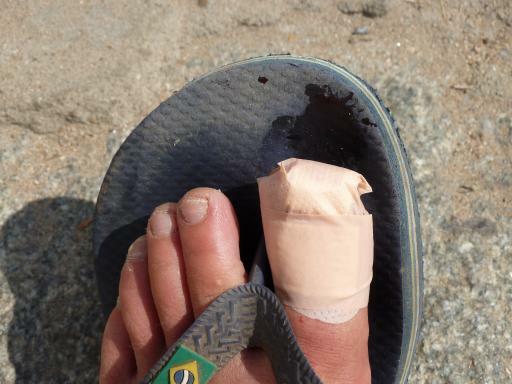 One way to tell if it’s really an athlete’s foot is if there’s an infection in the toe web between your fourth and fifth toe – your ring toe and pinkie. If it’s not there, the problem is usually not athlete’s foot. The infection is identical on both feet. It’s probably eczema or an allergic reaction to your shoes. It’s only on the top of your toes; contact dermatitis may be caused by shoe material. It occurs on child below the age of puberty. The foot is red, swollen, blistered and sore; severe dermatitis is the likely culprit. Sock it to ‘em. Wherever you take off or put on your socks, it’s a good practice to rub a sock up and down your toe webs. Get cooking with baking soda. Baking soda is cheaper alternative to expensive foot powders, yet it does essentially the same thing. Rub the mixture on your feet and between your toes. Leave it for about 15 minutes, rinse it off and dry thoroughly. The answer is blowing from your dryer. Use your hair dryer on the feet to dry them more effectively than you can with a towel. Find relief in sheep’s clothing. Placing lamb’s wool between the tips of your toes allows air to reach the affected skin, which helps make conditions less favorable for fungal growth. Put on some antiperspirant. Rubbing or spraying antiperspirant on your feet can keep them from sweating. Disinfect your shoes. After taking off your shoes, rub the insides with a cloth or paper towel that has a dab if disinfectant. Remove dead skin. When conditions starts to improve, remove any dead skin. Be a shoe swapper. In theory, you’re supposed to wear a pair of shoes only once every five days in order to allow shoes to really dry out between wearing.